Continuing a year of absolute superiority in the Formula 1 season, Sebastian Vettel took the top time in qualifying for the 2011 Monaco Grand Prix. Lapping the track with a final time trial speed of 1 minute, 13.556 seconds, Vettel's Red Bull-Renault was more half a second faster than the second-place qualifier Jenson Button. Defending Monaco Grand Prix winner and driver of the second Red Bull Racing car Mark Webber improved three grid positions from in the Q3 session for a third place starting spot. Within 4th to 7th place, Ferrari and Mercedes GP handled well around the 18-turn temporary street course. Continuing to show improvements through the season, the Fernando Alonso-driven Ferrari took 4th place ahead of Michael Schumacher. For the first time in the 2011 Formula 1 season, Schumacher out-performed his younger Mercedes GP teammate in qualifying with a 5th place grid position for the feature race at Monaco. Behind the second Ferrari of Felipe Massa, Nico Rosberg qualified in the 7th place spot after surviving a final practice crash unhurt just prior to qualifying. Unlike any another Formula 1 race circuit, the streets of Monte Carlo provides an unique spectacle. Racing within tight roads with a long tunnel and harbour in view, the Monaco Grand Prix offers an unusual scene for Formula 1 fans and competitors. To often pleasing, the unorthodox circuit is also known to present its own dangers. 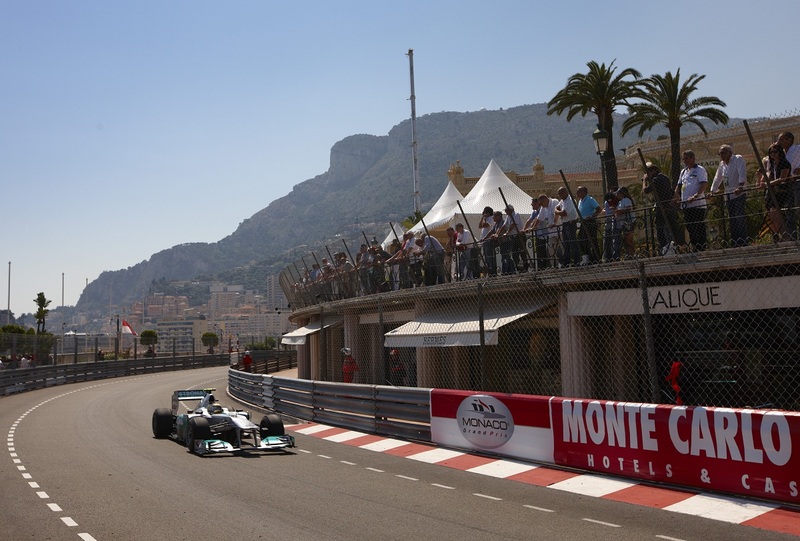 Nico Rosberg was not the only driver who endured the worst of the Monaco street circuit Saturday. Breaking into the top-10 for the final Q3 qualifying session, Mexico's Sergio Perez piloted his Sauber-Ferrari within the final moments of the time trials for the Monaco Grand Prix when he lost control coming out of the course's tunnel. Hitting the race track's retaining barrier's hard, Perez's Sauber was horrifically demolished. To the relief of everyone, driver Sergio Perez has conscious and suffered no major injures to the crash. Cautious, the Mexican Sauber driver was taken to Princess Grace Hospital for observation where he remained through to the night. Despite a fine qualifying effort, the rookie Formula 1 prospect Sergio Perez will be unable to start the Monaco Grand Prix.